Moving To Bellaire In Houston Can Be The Best Decision You Ever Made! Bellaire is one of many distinct townships within Houston’s boundaries, so it’s not always clear where it begins and the rest of the city ends. This is somewhat characteristic of Houston, which is filled with smaller towns that have been annexed into Houston proper. As such, most people don’t consider the township to be distinct from the city’s sprawl, but don’t tell the people who live here that. Bellaire is one of the oldest independent townships in Houston, as it was established in 1908. Just a decade after its founding, it was incorporated into Houston, which was expanding rapidly at the time. More than a century later, the area remains a popular destination for families looking to settle inside Houston, as it is a residential hub that remains close to everything the city offers. Bellaire is split down the middle by the west side of the 610 Loop. It is nestled between West University Place on its east side and the Gulfton area on its west border. To the south is Meyerland and to the north is Uptown and I-69. The township is right at the intersection of the 610 Loop and I-69, so people in the area can get anywhere they need with little trouble. Bellaire is similar to adjacent neighborhoods like West University Place and River Oaks. It is mostly residential, though unlike those other neighborhoods, one of Houston’s primary thoroughfares goes right through the heart of the area, and there are some commercial centers within its borders. This means that residents never have to go far to get everything they need, and most of the things they want. The township’s location is perfect for making a quick trip to most of Houston’s primary attractions, including all of its museums, parks and gathering spots. Bellaire Blvd. runs right into the south part of the Medical Center, and from here, it’s a quick jaunt to the Museum District and Hermann Park. The Museum District is home to the Houston Museum of Fine Arts, the Houston Museum of Natural Science, the Children’s Museum, the Health Museum and numerous smaller art and eclectic museums. Hermann Park is home to 445 acres’ worth of playgrounds, walking trails, lakes and the Houston Zoo. The park has been around for more than a century, so it’s a primary spot for group activities and festivals. This is also true of Memorial Park, which is just to the north. Memorial Park isn’t as old as Hermann Park (it was established in 1924), but it’s one of the largest urban park in the U.S. Memorial Park has tennis, golf and swimming facilities, as well as an arboretum and a host of hiking, jogging and biking trails. In addition to Hermann and Memorial Park, there are a pair of nature conservancies and learning centers close by. The Nature Discovery Center and Evelyn’s Park Conservancy are educational-focused spots where children of all ages can play and learn about the natural world. Many of these spots are within walking distance, so families have interesting educational resources available for those days where the kids want to get out and explore. 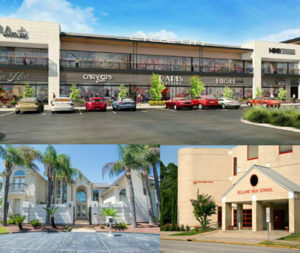 Being close to several commercial centers, the area offers extensive shopping and eating options. And its close proximity to cultural hubs like Montrose means that residents can always find something interesting to do. Bellaire may also be the best spot in Houston in terms of getting to all three major sports arenas. Minute Maid Park, Toyota Center and NRG Stadium are all within a 10 to 15 minute drive, so sports fanatics can easily take in a game without any trouble. Houston is the most diverse city in the nation, so it shouldn’t be a surprise that Bellaire represents this diversity. In fact, it’s one of the more integrated parts of Houston, with a large Asian and Hispanic population. A couple miles west is what many Houstonians call “little India,” with multiple Indian restaurants, as well as British-Indian fusion, Persian and Pakistani eating spots and shops. About half of all households in the area have children under the age of 18, and close to two-thirds are home to married couples. Families are the foundation in Bellaire, and there are many schools to serve those families. This includes some of Houston’s best private and Montessori schools, including the Post Oak School and a Mandarin Chinese language immersion school. Bellaire is bisected by one of the busiest thoroughfares in all of Houston, so you’ll have access to everything you need within easy driving distance. Yes, it’s a busy part of town, but it is primarily a residential area. So, although the city is right there, people living here can still find plenty of peace and quiet at a slower pace. Those wanting to settle in and enjoy themselves quickly should consider working with a professional moving company like JT Melia Moving and Storage, as they ensure everything is taken care of on the moving front. This includes packing, transporting, unpacking and setting up furniture. It’s a no-stress approach to getting started and will free up new residents to focus on more important things, like which restaurant or attraction to experience first.